(Posted on Pete Wright’s Facebook page, January 29, 2017). I think it’s likely that Judge Neil Gorsuch of the Tenth Circuit will be nominated as the next Justice on the Supreme Court. Judge Gorsuch has been on the Court of Appeals for the Tenth Circuit since 2006. I was curious about his record in special education cases so I did a “Google Scholar” caselaw search to find all special ed cases from the Tenth Circuit since 1996. I found eleven cases in which Judge Gorsuch participated on the three judge panel. Most of these were pro-school decisions. Of the eleven cases, he was the author of three. Garcia v. ABQ Pub Sch, 520 F.3d 1116 (2008). Compensatory education case; ruled in favor of school district. Thompson Sch Dist v. Luke P., 540 F.3d 1143 (2008). Reversed the hearing officer, review officer and US District Court to rule in favor of school district. He used the “some educational benefit” standard, i.e., an Endrew F. type of case. A.F. v. Espanola Pub Sch., 801 F.3d 1245 (2015). Judge Gorsuch held that parents failed to exhaust their 504 claim, i.e., a Fry type of case, and ruled in favor of the school district. Jefferson County Sch Dist v. Elizabeth E., 702 F.3d 1227 (2012) is a strong, pro-child decision in which he wrote an impressive concurring opinion. MS v. Utah Sch, 822 F.3d 1128 (2016), a strong, pro-child decision. 2017 may be one of the most dynamic years in the history of spec ed law. The last Supreme Court (SCOTUS) ruling in a special ed case was Forest Grove School District v. T.A. in 2009. Decisions in the Fry v. Napoleon case and and the Endrew F. cases are pending. When these cases are decided, we will have new additions to the body of special ed case law. 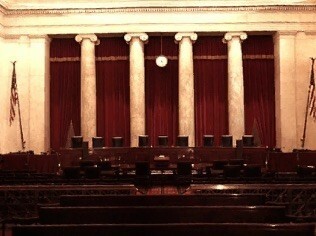 In what may confound and confuse the outcomes, we have only eight Justices on the Court. A 4-4 decision could muddy the waters re the legal issues in these two cases. If this happens, we hope the eight Justices will clarify the confusing standards in the Fry case re: issue of exhaustion and in the Endrew F. case re educational benefit. We hope these issues will be settled in ways that benefit of our children. On another note, I understand that some legislative staffers are working on possible revisions to IDEA. During the past few years, the Office for Civil Rights (OCR) and the Department of Justice (DOJ) have taken a more proactive stance on public school disability issues. We will have to wait and see what happens with the new administration including a new head of the US Department of Education who has little experience with public education and less experience with special education law. 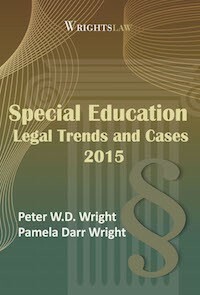 This time last year, Pam and I were working on a new book, Wrightslaw: Special Education Legal Developments and Cases 2015. That “Year in Review” book includes all U.S. Court of Appeals decisions, all guidance from the US Department of Education, Office for Civil Rights, and Department of Justice (USDOJ), and successful jury trials for damages in 2015. We are now working on Wrightslaw: Special Education Legal Developments and Cases 2016. We expect the Year in Review 2016 book to be available as an e-book and a printed bound book soon. This entry was posted in Attorneys, Cases, Damages, Discrimination / Section 504 / ADAA, FAPE, IDEA 2004, Legal Decisions, Legal News, Section 504, Special Ed Law by Pete Wright. Bookmark the permalink. Thank you for sharing this crucial information. I am looking forward to reading the Year in Review 2016 book. This administration makes me feel so uneasy that I withdrew my complaint that was taken up by the OCR and DOJ after the OCR gave us it’s findings and remedy. The DOJ hadn’t gotten there yet and I was worried about how they would use it with this new administration. At least we changed things at the local level. Thank you for this Pete. I’ve been looking for some specific case law to get a better understanding of where Neil Gorsuch stands in terms of IDEA. Much appreciated. I think its important to identify the percentage of pro-child vs pro school findings Gursuch was involved with against the national averages. Courts do not tend to find in favor or the child so I take this man’s decisions to be a good sign. Kimberly, In our last book, Special Education Legal Developments and Cases 2015, we reviewed all decisions by the Courts of Appeals in 2015, and identified whether the parent/child or the school prevailed. I believe about 50 cases were decided by the appeals courts in 2015. Hundreds of cases are decided at the district court level every year. We wrote the book last spring so I don’t remember how many cases went in each direction. We are working on the 2016 edition now, hope to have it available soon. Kimberly, I’m confused by your summary of Judge Gorsuch’s rulings. Of the 5 cases cited specifically above, it says he ruled in favor of the school district in 3 of the 5 cases, and in the summary statement at the top of this post, it is stated that in the 11 cases that Judge Gorsuch’s served on 3 judge panels, that “most” of those were pro-school decisions. I don’t see where it delineates his rulings specifically on those 11 cases, but it seems to imply that he is within the prevailing trend of ruling as pro-school.